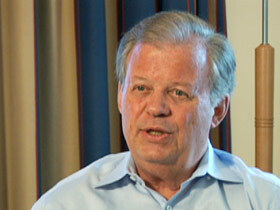 BOB ABERNETHY, anchor: Pope Benedict XVI began his Middle East visit in Jordan, met by its king and queen. He said he hoped the spiritual power of the Catholic Church could help bring about peace between Israelis and Palestinians. Monday the Pope travels to Israel. We have more on the Pope’s visit coming up. Meanwhile, there’s a little-known multifaith initiative also working for Middle East peace, with support from the U.S. government and visiting delegations of American Christians, Muslims and Jews. They say there can never be peace in the Holy Land without strong relationships between religious leaders. Kim Lawton is in Jerusalem. KIM LAWTON: Just outside of Bethlehem, an American group is touring the Aida Palestinian refugee camp. These are not typical Holy Land pilgrims. It’s is a delegation of Christian, Muslim and Jewish leaders who are part of an American faith-based initiative to bolster peace in this land of conflict. Former U.S. Ambassador Tony Hall is heading the initiative, along with Cardinal Theodore McCarrick. Ambassador TONY HALL: I don’t think any of us are under any illusions that we’re going to solve the peace problem, but we also realize that you can’t have peace without religious leaders, and that’s why we come here and try to build these relationships. LAWTON: This is Hall’s thirteenth trip to the region in the last 24 months. He says as a former Democratic congressman and ambassador he’s seen the limits of politics and diplomacy. Amb. HALL: I have, you know, voted for war, I’ve voted against war. I’ve voted for this program or that program. I have spoken against treaties. As an ambassador I signed treaties. About the only thing I know that works: building relationships, praying together, and let the faith aspect take over. It’s strong. It’s powerful. We never do it. LAWTON: For more than two years, the U.S government has supported a dual-pronged approach: bringing interfaith groups of Americans to meet with their counterparts here in the Holy Land, and supporting a coalition of top religious leaders here who are trying to create an environment where peace can take hold. Amb. HALL (at press conference, from file footage): What you have before you is a council not of religious leaders, but of the religious leaders. Rabbi DAVID ROSEN (American Jewish Committee, Israel): Never in the history of the Holy Land did there ever exist a body of the leadership of the three faiths of this land. I suppose it’s both wonderful and pathetic. It’s pathetic that this has never happened before. It’s wonderful that, despite everything, we’ve managed to keep it going. LAWTON: The council has established a rapid communication hotline to address protection of holy sites and to respond to derogatory portrayals of other faiths in the media or within religious communities. Now, the council is launching a project to monitor school textbooks. According to council member and Lutheran Bishop Munib Younan, that project is much needed. Bishop MUNIB YOUNAN (Evangelical Lutheran Church in Jordan and the Holy Land): We are working now on monitoring the textbooks both in Israel and Palestine, and to see, you see, what we teach about the other, because usually what we teach about the other is very shameful. LAWTON: Still, politics all too often interferes. Tensions have been particularly high since the recent conflict between Israel and Gaza. Rabbi ROSEN: While most Christian denominations can be said to be independent, Jewish and Muslim religious representatives are subject to, if not subjugated by, the political authorities. So when things are tough politically, it tends to be much more difficult for them to be at the table. And yet, not withstanding all those pressures, we still manage to weather the storms. 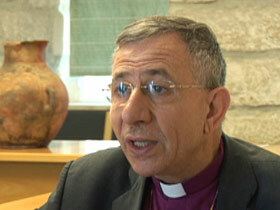 Bishop YOUNAN: We have the suffering of our people under our skin. So when we sit we speak on reality. So this is the reason sometimes it’s difficult. LAWTON: Hall brings interfaith delegations from the U.S. to encourage council members and to meet with local Muslim, Christian and Jewish groups across the spectrum. The deliberately interfaith nature of the group can be challenging, especially when people confront viewpoints different from their own. Suhail Khan is an American Muslim with the Institute for Global Engagement. SUHAIL KHAN (Senior Fellow for Christian-Muslim Understanding , Institute for Global Engagement): You definitely feel that there are different narratives. 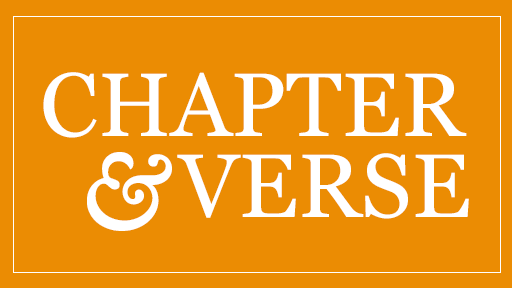 and you feel different people within the group sometimes bristling at what they’re hearing, sometimes not willing to accept whatever narrative they might be hearing at the time, and so that has been a challenge but, again, I’m finding that it’s helping us really come together. Bishop YOUNAN: For me, it’s important that they see reality and see the complexity of the reality in which we are living as, in this part of the world — to hear both sides, both fears, both worries, but at the same time not to abide in the fears and the worries — to give us a sign of hope. LAWTON: Several delegation members say they are returning to the U.S. with a new sense of responsibility for getting involved in the peace process. Rabbi STEVE GUTOW (President, Jewish Council for Public Affairs): I mean, the power of bringing Christians and Muslims and Jews together — it’s stunning and powerful. And if we bring, you know, the real masses of our faith and the real elites of our faith and get them deeply engaged that something needs to be done here, I think we’ve done something good. LAWTON: The initiative began under the Bush administration, but leaders on both sides of the ocean hope President Obama will continue the program, and perhaps even expand it. Rabbi ROSEN: So I’m hoping that this new administration, especially with the contacts we have thanks to our friends in the United States who have been so supportive of the work that we do, that we can be perceived as a stakeholder and a strategic asset on the part of this administration in its new initiatives. 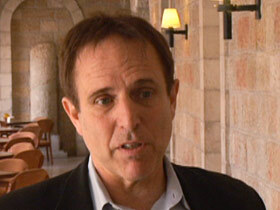 LAWTON: There are also questions about how supportive Israel’s new political leadership may be. Rabbi ROSEN: I wouldn’t automatically assume that the fact that it is more right wing and less inclined to make political concessions means that it is going to be less understanding of the religious dimension. LAWTON: Ambassador Hall admits the task can seem daunting. Amb. HALL: It’s tough. This is a tough country. It’s a tough Holy Land. Everybody, you know, talks about peace, but it’s peace talking, not peace making. So I think it’s a matter of building relationships, it’s a matter of coming back, it’s a matter of doing it drip by drip. LAWTON: And as people of faith they say they won’t give up. Rabbi GUTOW: I think when one brings God into the equation, when one brings our highest selves, our spiritual selves, into the decision making, I think that hope always springs, that hope is always there. 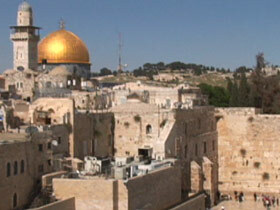 ABERNETHY: Kim Lawton joins us now from Jerusalem. Kim, it seems from here that this is an unusually difficult time for peacemaking there. What’s your sense of what Pope Benedict can accomplish? LAWTON: Well, certainly the tensions from the conflict over Gaza in recent months are still very much a part of the mix here. Pope Benedict has said that this is not a political mission, but a spiritual pilgrimage. But, of course, there is a strong political overtone to everything he says and does. He has spoken very frequently about his concern about the conflict here. He cares very much about Middle East peace. He will be meeting with political leaders, and people are hoping that he can use that sort of moral bully pulpit that he has to, indeed, have an influence. ABERNETHY: In recent years the pope has said some things and done some things that have offended both Muslims and Jews, so there’s some fence-mending to be done, too, isn’t there? LAWTON: Indeed, he really has some multifaith challenges before him. He will be visiting some mosques in Jordan and here in Israel. He’ll be the first pope to actually visit the Dome of the Rock, which is so important to Muslims—one of their holiest sites. He’s hoping that symbolism of going to those places will help counteract some of the negative publicity he got after he made a speech where he quoted a Byzantine emperor who had some not very nice things to say about the Prophet Mohammad. But he’s hoping that the visual impact of this trip will help. The same thing with the Jewish community: there have been some concerns after the pope lifted the excommunication of a bishop who denied the Holocaust and some other issues. The Vatican has been working hard behind the scenes to repair those relationships, and so now, again, they hope that there’s a really public, visual indication that the pope does care about the Muslim people and the Jewish people. ABERNETHY: Kim, when the pope and other religious leaders speak about bringing spiritual power to bear on complex political issues, how do they think that can work? LAWTON: Well, for them as people of faith, the most — the biggest power is indeed spiritual power, and so I think that’s what they’re hoping they can draw upon to really make a difference here. You know, when I spoke with Ambassador Tony Hall about his effort he said we’ve tried everything else and nothing else has worked, so why not do that, especially in this place which is so holy to the three major religions of the world. Religion is so tied to the politics that it’s hard to separate it out, and I think the pope and a lot of the other religious leaders that I’ve been talking to really in order for peace to firmly take hold you have to have the religious community on board and you have to harness some of that spiritual power.